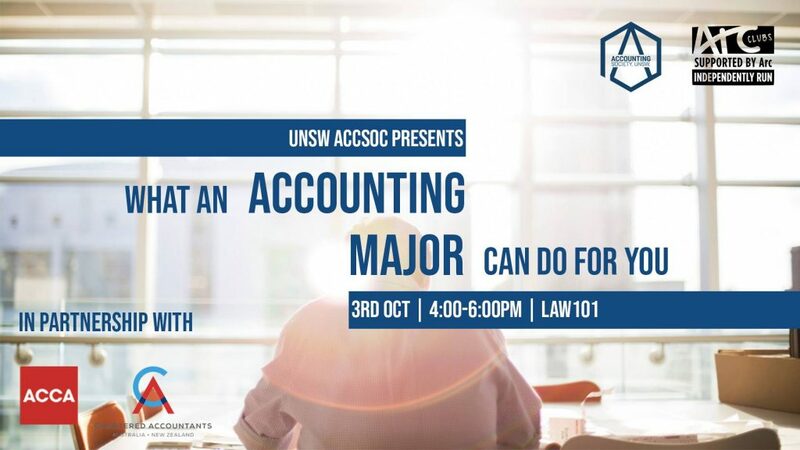 UNSW AccSoc Presents: What An Accounting Major Can Do For You? So. You’ve picked an accounting major and been crunching the numbers for so long you’ve forgotten what you can do with it. The team here at AccSoc have prepared a comprehensive session to get you up to speed on the opportunities available to you throughout your study and professional career! With sponsors from CA and ACCA attending on the day, make sure you get the inside scoop on how to further your career. Whether you’re keen on being an accountant, or consulting takes your fancy, or maybe you want to accomplish your CA dreams and enhance your learning – we’ve got you covered! WHAT TO BRING: Your enthusiasm!